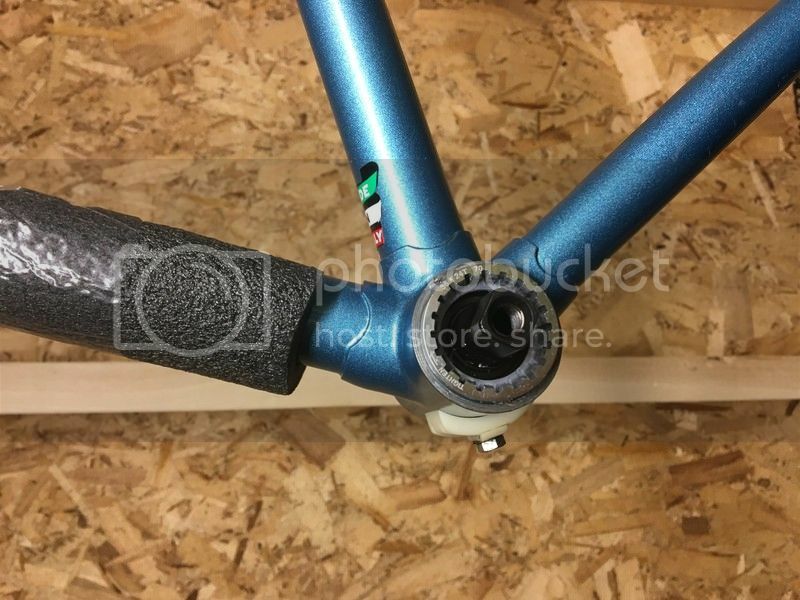 Hi guys and gals, I recently purchased a Bianchi rekord 841 frame and am looking to make it a single speed city bike for taking to the breweries/etc. I'll be posting pictures when I receive the frame, but for now I'm just trying to read up on the best parts to build it. I'm also looking for information on the frame and I figured this might be a good resource. I have no clue what year it is, but I do know it is a Bianchi rekord 841 in blue ice metallic and I do have the serial number. 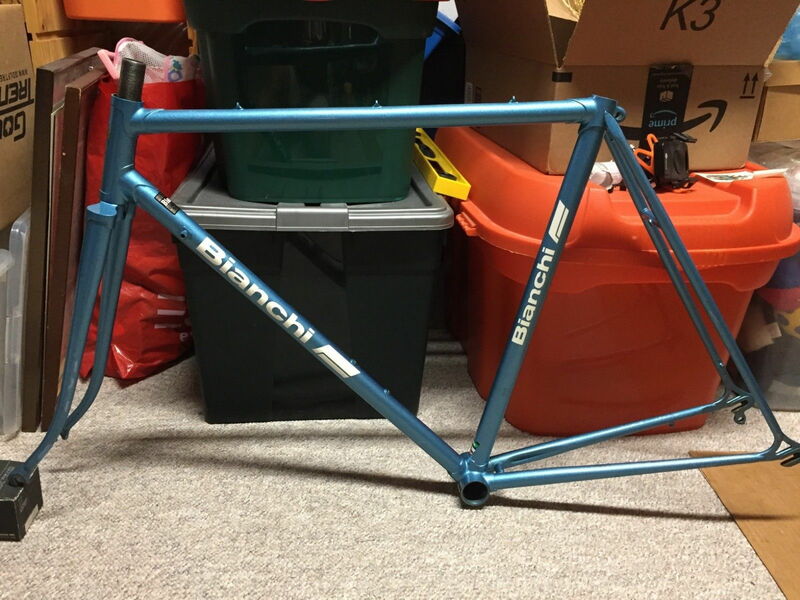 I am hoping this is actually an Italian made Bianchi, but I'm betting it's a Japanese frame because I got it for $100 on eBay. You can link to the Ebay listing for now. Also, please don't cut anything off of the frame, especially if it turns out to be Italian made. Amen to that! Keep your -- or a future owner's -- options open. I had planned on buying that one but my question is why OP didnt buy a single speed frameset. I just wanted any bianchi frame in my size. I didn't care what it was and happened to like this one. I will not be cutting anything off of it. Just wanted to make a cheap single speed. Lighter weight especially since it's a steel frame, and less maintenance. This is really just going to be a fun bike for riding to dinner with the wife, going to breweries, etc. I live in FL, so there are no hills. Why not a single speed? Yes, that was the correct listing. Thanks to all who contributed. I was thinking it was '85-'87, but didn't have anything to base it off of. Serial looks to be 165422. Last edited by vailskier3; 09-26-18 at 02:02 PM. Reason: added thanks. European market, entry level racing frame, circa 1985-1987, manufactured in Italy, by Chiorda, using hi-tensile steel. That assumes the decals the decals are OEM but frame features corroborate the time frame and lower level. Thanks for the input! It's really hard to find anything on this bike. I can hardly find any rekord 841's on the google machine. Anyways, I love it and can't wait to get started! Ok, so first purchase was crankset. I ended up getting a vintage Ofmega Bianchi branded crankset with a 52/42 and I removed the 52. Planning on running the 42 with maybe a 15t or 16t on the rear. Haven't figured that out yet. Pics later. 1. I installed the cartridge side first, and then the cup side. Is this right? 2. Does it matter which side the cup is on? 3. It felt a little grindy, but maybe felt like it was supposed to be hard to tighten down. Is this normal? 4. There are maybe a couple mm of threads still showing as i tightened them down as much as I could, is this normal? Hoping that I didn't completely mess up my build! Cartridge goes in drive side. Threads showing on non drive side is ok. I usually put cartridge in first but if non drive side is plastic sometimes I reverse procedure. In the second case you have to estimate how far to put non drive side in. Last edited by 52telecaster; 10-24-18 at 03:33 PM. Perfect! Thank you! I was so scared I messed it up! Just take it slow and have fun, for references you can look up Sheldon Brown on the web and RJ the bike guy on Youtube and Randy Jawa's (forum member) site Mytendspeeds. And of course ask the forum chances are someone will know,. And pictures, we love pictures. Also a hop based beverage while you work is often referred to as a Patience Enhancer. funny you should mention that. my brother and i usually describe how difficult a job is based on the number of beers you would drink in the time it takes you to complete the task. also, i referenced sheldon brown, but i couldn't find the details on whether or not cartridge went on the drive side even with italian threaded bb. also, he didn't have info on whether or not a couple threads showing was a big deal. there is great information on his site, but i was feeling like i had very specific questions that i needed answered. yeah if it's tight. If it creaks it needs to be tighter. Good job! okay, i have about $100 for wheels. 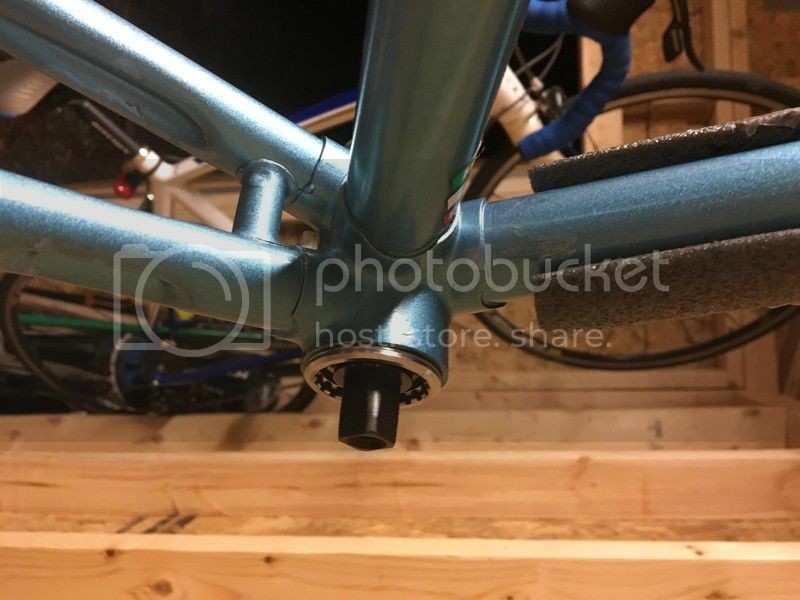 should i buy them premade, or buy hubs and have wheels built? opinions? You may not have thought of this yet. Your frame will have rear dropout spacing (inside to inside) for a geared bike of that era. So, it might be 126mm or it might have been widened by a prior owner. Your wheelset, if a classic single speed or flip-flop hub, will be more like 120mm. Have you thought whether or not you'll cold set the frame to a narrower width (it affects chainline by half the distance difference)? You can do it yourself or you can find a competent shop that will do it for you. $100 won't get you much in the way of new wheels. Have you looked at your local Craigslist and Facebook for sale to see what single speed wheelsets are out there? Might be more economical for you. Look for a machined braking surface on the rims, if possible. i think it is 130mm, and I was planning on just running spacers for the rear cog to straighten up the chainline. i've kind of had my eye on mavic aksiums. seen a few sets around $100, but just wanted to see if anyone else had good ideas or a better route to go. trying to build this bike pretty cheap, but also as best as i can.